When it comes to the security of your home or business, it is important to choose a reliable security company that you can trust. 1st Choice Security Systems is that company. We have been providing world-class security solutions to businesses and homeowners in St Albans for more than 10 years. Our company has the skills, experience, and technical knowledge necessary to keep you safe. We employ an experienced security team that understands the unique security threats present in St Albans and the surrounding areas including London Colney, Townsend, Marshalswick, New Greens and Jersey Farm. Our consultants will create a security strategy that is specifically designed to address any security concerns that you have. Our service technicians will promptly arrive and assess the gate — determining which components are malfunctioning and need to be repaired or replaced. We will make every effort to immediately repair your electric gate if possible. All work is undertaken in a way that avoids interruption to your business or the residents who live at the property. If your electric gate requires additional parts, we will immediately order them and give you an estimate on the time required for the repair to be completed. While St. Albans is one of the safer locations within Hertfordshire, there has been a recent increase in burglaries and other crimes. In 2015, there was a 20% increase in burglaries in St. Albans, leading police to warn homeowners and business owners about the increased risk to their property. St. Albans police also noted that many homes within the city are vulnerable because they are unoccupied during the day. A professionally installed electric gate can dramatically reduce the risk of a burglary or other crime occurring at your business or home. You can relax, safe in the knowledge that the entrance to your property is secured with a well-built electric gate security system. 1st Choice Security Systems has installed many automatic gates in St. Albans for both commercial and residential clients. Our team knows the city well, which helps us plan and install a security gate that protects you from local security issues. When we install automatic gates in St. Albans, we first talk with the client to determine their security concerns. Our team then inspects the installation location to determine if there are any issues preventing correct installation of the gate. We assess the site’s security and ensure the automatic gate design is appropriate for the security requirements of the property. 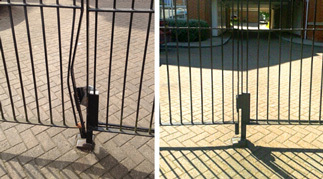 Our engineers then install your gate quickly and efficiently. Our goal is two-fold — to ensure the gate is correctly installed and to minimise the disruption to your home or business. We can also integrate your new electric gate with any other security infrastructure you have, including access control systems and CCTV. 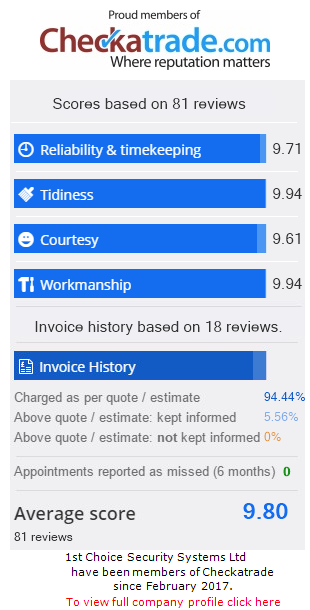 Our repair services are efficient and reliable. If the sliding electric gate has a serious issue, we will provide a detailed quote, informing you of the precise repairs that are required. 1st Choice Security Systems also performs upgrades to electric sliding gates in St. Albans. We can add new panels to your gate, increase its height, or update the mechanical components of your system. If you currently have a gate that is manually-operated, we can add an electric motor and sensors to automate entry to your property. Our team can also add additional security infrastructure to your existing gate, including CCTV, entry sensors, access control systems, and safety features. Our company offers all prospective clients free security assessments. One of our security consultants will visit your property and assess your security risks. They will then provide a comprehensive run down of the actions you can take to your property more secure. We never do a hard sell during these meetings — they are performed to make you aware of the options you have for improving your security. Our team has the skills and knowledge required to install automatic gates in St. Albans that integrate access control systems and surveillance tools. Visit CAMESAFE and pop in our ID code (2541) to see our credentials.